Basketball, one of the world’s most popular sporting event, needs tremendous physical agility from the players. The players need to run and shoot the ball into the hoop in order to score. The comprehensive range of uniforms for this sporting event is available in the market. The players as well as the lovers need to wear these during the game as well as during the training. Most of the teams are looking for customized designs. The customized basketball uniforms are specially created collections which are made according to the need of the teams and the clubs. Nowadays, it is the desire of every team that its players should have an appealing look. Moreover, unique shades also provide unique identity to the teams. It helps the teams to draw the attention of the sponsors. The most popular fabric which is widely used by basketball manufacturers is polyester. This is a very comfy fabric. The outfits manufactured out of this provide wide flexibility to the players during the game. Moreover, the designs are also created with the help of the computer software. These are imprinted using the sublimation printing technology in order to make them impeccable in terms of quality. 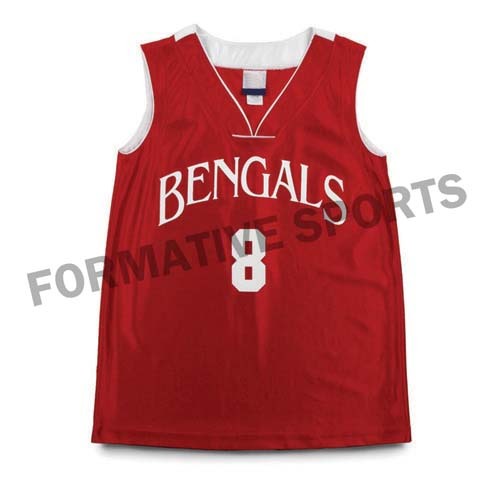 Buy directly from the leading Basketball Uniforms Manufacturers - Formative Sports at best price.